Hello and welcome back to my blog. I hope that you have enjoyed my previous posts and have possibly learned something from them, I know I have. If this is your first time to my site, welcome! Please read some of my previous hosts and bookmark my page and like my facebook page to stay up to date on new posts. Now, on to the topic of the day, Fox Hunting! Fox hunting can be very fun. Not only are you getting out and doing something with your hobby but you are learning something about it in the process. You learn about propagation, amplitude, how objects can interfere with transmissions, etc. Fox hunting can be done on any band in the amateur radio spectrum. Fox hunts can be a local thing that your club does where everyone is on foot, it could be a little bigger like encompassing a whole city or even be on hf and cover a few states or a large 100+ mile radius. The size and scale of fox hunting is limited only by your imagination. As I was doing some research for this topic I ran across a page that talked about how a club did a scavenger hunt using fox hunting techniques. They sent up multiple transmitters on different frequencies, and started the “hunters” off on the starting frequency. 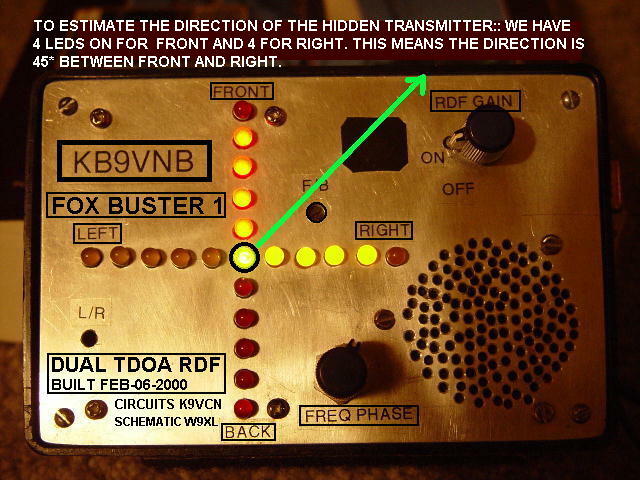 Â When the first location was found it had the frequency of the next “fox” and so on. Its sounds like that would have been a really fun thing to participate in. The basic type of directional antenna is the yagi antenna. It is not only used for fox hunting but is used on a normal station to extend the range at which that operator can talk. 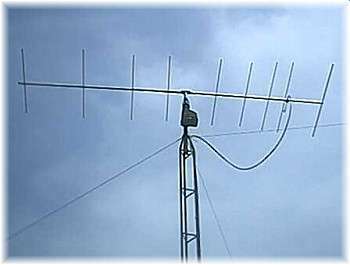 The above picture is a typical yagi antenna that may be used by a ham at his/her home station. The problem with this type of antenna is that it is at a fixed location and doesn’t really fit well in your hand or vehicle. 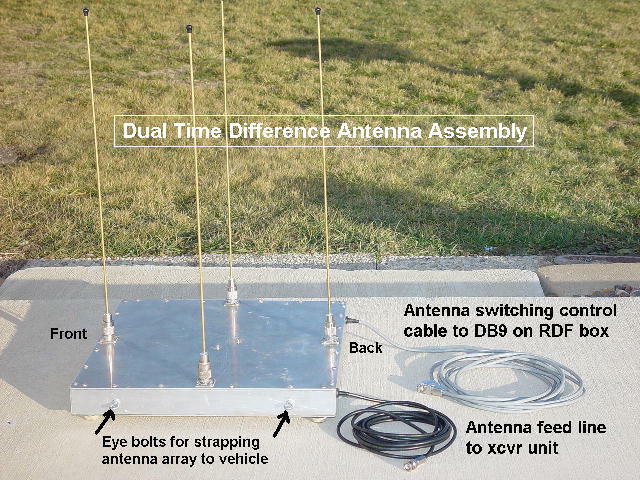 Here is an example setup of a handheld yagi antenna used in direction finding. If you look close enough you will notice that the elements of the antenna are made from a tape measure. This allows to them to be easily collapsed and put in a vehicle and makes the whole system to be very light. Another type of antenna used is fox hunting is the delta loop antenna. This type of antenna is basically the same as the yagi, except unlike the yagi, the signal can be coming from two locations. With the yagi antenna, the signal is strongest in the direction that the shortest element is facing. With a loop antenna, the signal can be coming from in front or behind you. Image the antenna in the picture above is attached to your handheld radio and you are holding your radio in front of your face so you can see the s-meter. Looking directly at the antenna as it is positioned in picture above is straight ahead of you and you are getting a S9 on your hand held. The signal could be coming from straight ahead of you or directly behind you. If it was coming from the left or right you would get very little, if any, signal. So with this type of antenna you have to use triangulation a little more than you would in a yagi antenna. This type of system is called a doppler system. The system uses a minimum of 4 antennas in a 0,90,180,270 degree location. The circuitry of the display unit takes the received transmission strength from each antenna and does the “hard” math to figure out which way the signal is coming from and displays it for the end user. The pictures above come from a website I found while writing this article. The plans and software used in the project are free to download on the page. Here is the link to it:Â http://home.earthlink.net/~w9xl/index.html. This device is put inline between your receiver and your antenna. As your incoming signal strength increases to the point where whichever way you turn, you can flip one of the switches to decrease the strength. The max DB reduction on this unit is 75DB. Of course the last thing that you need is some type of receiver. It can be anything from a HT to a scanner, to one of the doppler systems shown above. As long as it has a signal strength meter, it will work. I hope that this post might peak your interest in fox hunting, or at least give you a little more information about it and what it’s all about. If you enjoyed this post or any of the other posts on my blog, please bookmark this page, like my facebook page and please share my post/blog with your friends. Thanks for stopping by and I hope that you will come back again.